Last weekend, my brother took his first hot air balloon ride near his home in Boise Idaho. He posted a couple of photographs documenting the event on his Facebook page. In response I commented that I noticed his wife wasn’t in any of the pictures. He replied that ballooning wasn’t on her “Bucket List” but it was on his and so she had given him the gift certificate for the flight as a Christmas gift. My husband and I had gotten a similar gift from our daughter for Christmas the previous year and we took our flight over Vermont last fall. 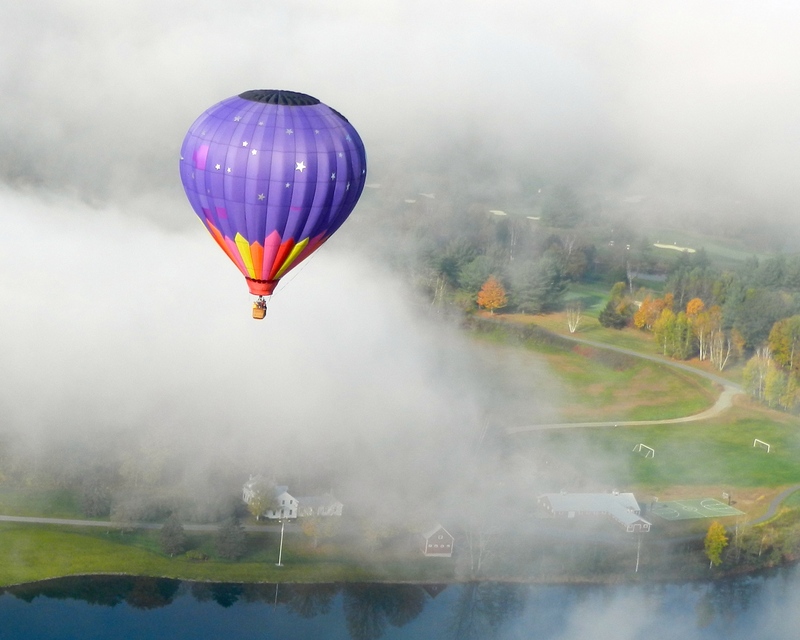 Neither my husband or I have a Bucket List but were grateful to have had the opportunity to drift over the Vermont countryside just as the fog was lifting on a beautiful autumn morning. There seems to be a lot of talk these days of Bucket Lists. There are even apps, programs and books that help you to assemble and keep track of those things to do, places to go and people to meet before your life on earth is through. The actual term Bucket List is a fairly recent phenomenon, seemingly made popular by the 2007 movie of the same name staring Jack Nicholson and Morgan Freeman as two terminally ill men who embark on a road trip to do all the things that want to do before they “kick the bucket”. I think the idea of some sort of a to do list before you die probably predates that even though the term itself wasn’t widely used. When I retired in 2005, I received as a gift a book titled, 1,000 Places to See Before you Die by Patricia Schultz. Who could even afford to see all 1,000 places let alone have the time to visit all of them? In any event, in the past ten years it seems as though a lot of people feel the need to make a list and tick the boxes as each must do is completed. The problem I see with a Bucket List is that it narrows your focus. To me, the key is to be open to new opportunities as they present themselves rather than to be constrained by a list often influenced by others tastes and interests. In my travels I often see people who are more interested in checking a particular destination off their “must see or do” list rather that enjoying the adventure and being present in the moment. I call it collecting destinations rather than making memories. Sharing an afternoon with Dorothy Molter, aka the Root Beer Lady, at her island home on our first trip to the Boundary Waters Canoe Area in 1983, fishing off the side of a Coast Guard Cutter on the Inside Passage from Alaska, buying a Chuhai from a vending machine on the streets of Tokyo, and watching kids play soccer on the dusty streets of Havana are just a few examples of the kind of unplanned, yet truly memorable experiences I have from my travels. Don’t get me wrong, I encourage everyone to think about what kind of things they would like to try or places they would like to see and to figure out how you can make that happen. But remember to be flexible. Our interests change over time and so do conditions around the world. Be willing to consider alternatives. Whether or not you check off every box on your list before you kick the bucket is not nearly as important as taking advantage of the opportunities you are given. And, as I like to say, the journey is every bit as important as the destination. This entry was tagged bucket list, collecting destinations, kick the bucket, opportunities, travel. Bookmark the permalink.